OK it might seem conspicuous to have so many Odyssey putters in out list but they are sort of dominating the putter space right now and have so many models and styles that you have to give them all a shot. Plus, they really concentrate on the technology in manufacturing good putters. Oh, yes, they have some dogs as well, but this is probably my favorite of all their putters except the long putters. It combines two top elements in putters – a traditional heal-toe blade design that is face-weighted with a lined two ball alignment device that makes for a darn easy to line up putter. The hard polymer face does a nice solid job of sending the ball on its way though I do wish it were more textured. 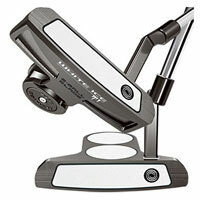 I cant say if this putter would be better for the beginner, middle handicapper or low handicap player. I may have to give it a try myself after putting with it for a while. It’s mid-priced at $179.